Joseph Zitnyar’s life goal is to someday create new medicines to help improve human health and quality of life. 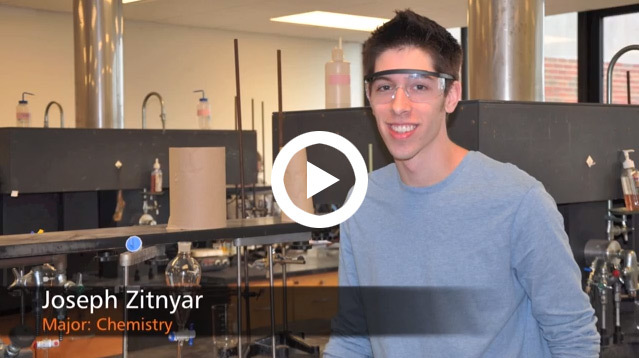 Zitnyar, a sophomore from Memphis, came to UT Martin on a spur-of-the-moment decision, but quickly found his place in the chemistry department. A chemistry major, he hopes to go to pharmacy school after graduation from UT Martin. Pharmacists work in many areas, including retail outlets, hospitals and research facilities. Zitnyar would like to start his career in the retail pharmacy industry and eventually transition into the research field. “I love to find new things and make new medicines. I would love to create a new medicine to cure something like the common cold. That’s really where my heart lies is in research,” he said. 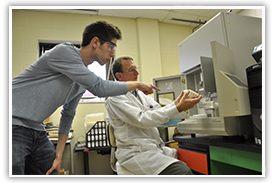 His lecture courses and hands-on laboratory experiences at UT Martin are preparing him not only for the scientific world of chemistry, but also for the rigorous coursework required of pharmacy students. He is looking forward to conducting undergraduate research in either organic or biochemistry, since those areas are closely related to the field of human medicine. His favorite course at UT Martin has been organic chemistry, a subject that comes naturally to him. Even though he came to UT Martin on the last-minute recommendation of a high school friend, Zitnyar stayed because of the exceptional science program and chemistry department faculty. “If you’re serious about academics, this is the place to be. I could find no better school for the price,” Zitnyar said, giving advice to potential students. “It’s a relaxed atmosphere and it’s a little like a community, so you can get to know everybody,” he added. Zitnyar’s first graduate school choice is the UT Health Science Center in Memphis.